Beef Barley Soup has to be high on the list when it comes to hearty soups as it is filled with warmth and energy that can help keep you going strong through most of the day, after all that’s why it’s called hearty. This homemade soup recipe is definitely different because by adding one extra ingredient it will taste like you cooked it over an open fire and its taste is undeniably unique and delicious. Preheat a large soup pot over medium heat and then add the olive oil, chopped onions and a pinch of salt. Stir and sauté on medium heat for about 5 – 7 minutes or until onions look glazed and translucent. The salt helps draw out extra moisture and flavor. Then add the garlic and sauté a couple of minutes longer. Now add the beef with a little salt and pepper and stir the mixture until the beef has browned. Once the beef is brown add the carrots, celery, caraway seed and bay leafs and sauté the mixture a couple of minutes until the carrots and celery become a little glazed then add the tomatoes stir and sauté a little more until the tomatoes release a little of their juices. Yum, this is the start of a wonderful broth. Now add in the 4 – 5 BBQ short ribs that have been prepared in advanced. It doesn’t matter if they are hot or cold as long as they were cooked on the BBQ at some point you will get your outdoor cooked flavor. Stir well and then add 8 cups of water. 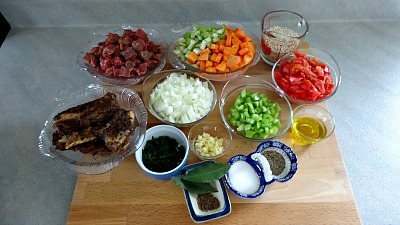 Now is a good time to salt and pepper the beef barley soup to your liking. Turn heat to high and bring ingredients to a boil, then reduce heat to low, cover and simmer for about 1 ½ hours. Add the pearl barley and cook as long as directed on package, usually about 40 minutes. Once you’ve taste tested the barley making sure it is cooked you can turn off the heat completely and remove the bay leafs and the short ribs from the soup. You can enjoy the short ribs as a separate meal or remove as much meat from the ribs as possible and add it back to the soup as not to waste any of the meat. The short ribs tend to release a little fat to the soup but it is easy to skim the fat off as it floats to the top. • There are different types of barley and cooking times can vary anywhere between 15 – 40 minutes so it is important to check the package and what cooking time they recommend. • So, if you use fast cooking barley (15 minutes and cooked) it is wise to cook your soup for about 2 hours before adding the barley, this makes sure your soup is well cooked. But if you are using barley which takes 40 minutes to cook than you can add it earlier into the soup as we did in the above recipe. • If you’ve got the BBQ going it is a good idea to cook the short ribs for this recipe so they can be ready to go at any time, keep in the fridge until you are ready for them. • If the next day you find the soup a little too thick dilute it with a cup of water depending on the consistency you like. • In this recipe you can also substitute a couple of cups of water and replace it with beef broth or add 1 – 2 beef bouillon cubes to give it an enhanced beefy flavor. • The BBQ short ribs are only an optional ingredient to give it a unique outdoor cooked flavor. Some people love that specific taste of the outdoors as it is rare to find it anywhere. 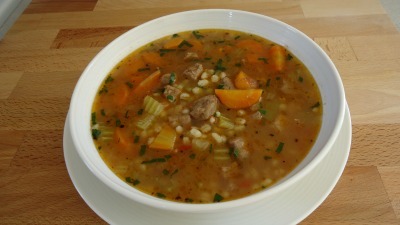 This beef barley soup recipe makes about 4 – 6 servings.